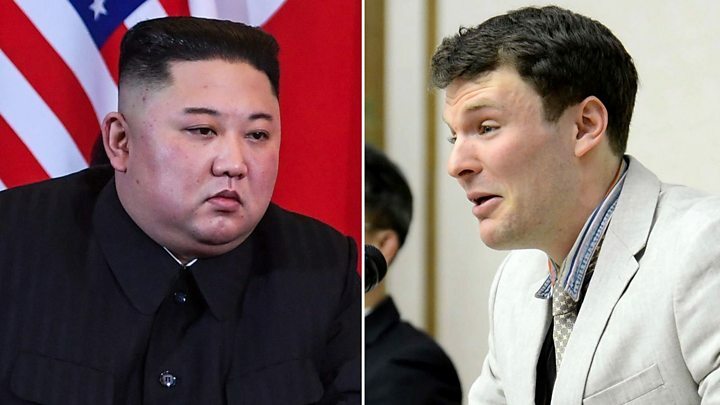 Media captionWas Kim Jong-un really clueless about US student Otto Warmbier's ordeal? After the family's blistering statement was released, Mr Trump took to Twitter where he said he had been "misinterpreted". "Kim and his evil regime are responsible for unimaginable cruelty and inhumanity. "No excuse or lavish praise can change that." The University of Virginia student was sentenced to 15 years' hard labour, but released after 17 months. The Warmbiers attended the 2018 State of the Union speech as the president's guests, weeping as he called them "powerful witnesses to a menace that threatens our world". What did Trump say about Kim? The president added that the North Korean leader felt "very badly" about the case. The president - who is now back at the White House - said he gets along "really well" with Mr Kim. "And he's a real personality and he's very smart. He's sharp as you can be, and he's a real leader, and he's pretty mercurial. "I don't say that necessarily in a bad way, but he's a pretty mercurial guy." The Fox host defended the president's decision to walk away, recommending a reading of Mr Trump's book, The Art of the Deal, to truly "understand" his tactics. After the talks broke down, North Korean officials contradicted Mr Trump's contention that a sticking point was Pyongyang's demand for total sanctions relief. "This proposal was the biggest denuclearisation measure we could take at the present stage when taking into consideration the current level of confidence between the DPRK [North Korea] and the United States," said Mr Ri. North Korea's state-run media struck an upbeat tone on Friday, without mentioning that the summit had ended early. News agency KCNA said the two leaders had promised to remain in touch in order to continue the "epochal development" of bilateral relations and the denuclearisation of the Korean peninsula. "The top leaders of the two countries highly appreciated at the one-on-one talks and extended talks that a remarkable progress has been made in the historic course of implementing the Singapore joint statement," said KCNA. On Friday, Mr Trump tweeted: "I never like being misinterpreted, but especially when it comes to Otto Warmbier and his great family." He said that Warmbier and his family "have become a tremendous symbol of strong passion and strength, which will last for many years into the future". "I love Otto and think of him often!" he added. It comes after Democrats led criticism of the president, pointing out that Mr Trump has previously sided with strongmen. 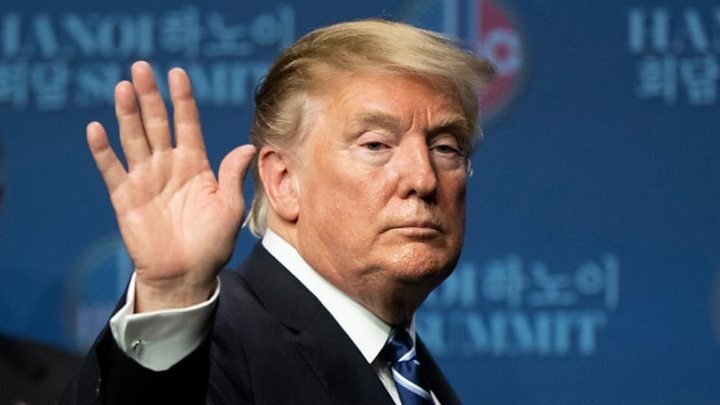 Critics also pointed out that last December, Mr Trump defended Saudi Crown Prince Mohammed bin Salman despite CIA officials' belief that the royal had ordered the gruesome murder of a US-based reporter, Jamal Khashoggi. Later on Friday, White House aide Kellyanne Conway said Mr Trump "agrees with the Warmbier family and holds North Korea responsible" for their son's death. "He has deep affection and shares the grief with the Warmbier family," she told Fox News. "What the president is saying is that there's no indication Chairman Kim knew what happened to Otto Warmbier when it happened," she added. Russian state-controlled media - once quite the fans of Donald Trump - were scathing about the US president's performance at the talks. 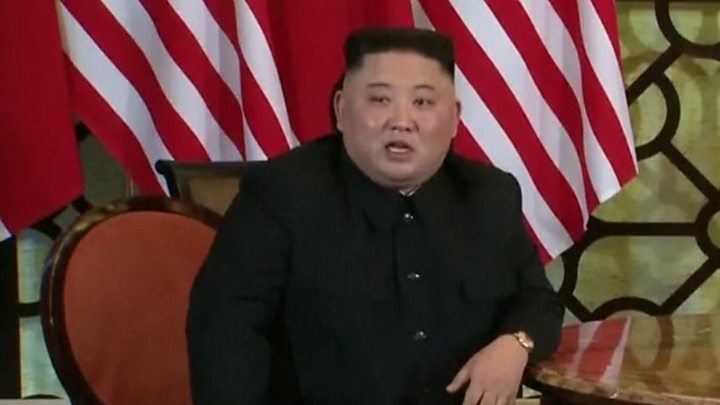 A Channel One report from the summit said it had "failed miserably, dealing another blow to the reputation of the American leader". Over on Rossiya 1 TV, a presenter said the outcome was "predictable", as Mr Trump had "arrived at the new summit with old tactics", while NTV pointed out that Russia had warned Washington's "position of ultimatums" would not work. In the papers, the independent Novaya Gazeta looks on the bright side, saying that the leaders - while "still extremely far from the Nobel Peace Prize" - have at least stopped swapping insults. But in mass tabloid Moskovsky Komsomolets, one pundit is withering, saying one "has to understand the core of a subject to make compromises, while Trump is the most ignorant head of state in US history".